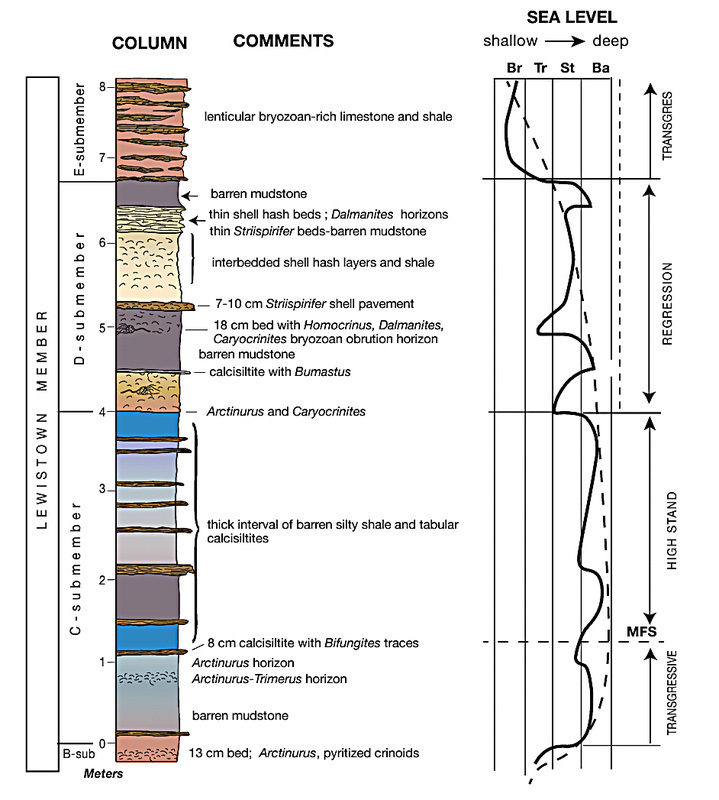 Detailed stratigraphic section of the middle Lewiston Member of the Rochester Shale at the Caleb Quarry showing distribution of fossil beds. Curves to the right show inferred depositional cycles of the lower Rochester Shale, aligned with the stratigraphic column. Solid line shows short-term fluctuations in relative sea level; dashed line shows overall or averaged pattern of deepening and shallowing through Lewiston submember C to E. Abbreviations above curves are for indicators of relative water depth (see text for discussion of depths): Br: bryozoan thicket biofacies (communities); Tr: transitional biofacies; local patches of bryozoans with cystoids and other fauna; St: Striispirifer brachiopods dominate; minor bryozoans, small crinoids such as Homocrinus; Ba: largely barren, except for rare trilobites, small brachiopods and trace fossils. Sequence stratigraphic interpretation on far right gives inferred patterns of shoreline shift for the overall, large-scale cycle: transgression; shoreline migrating up slope, toward north; MFS: maximum flooding surface; Highstand; sea level high and relatively stable, with increasing mud sedimentation offshore; regression, sea level is falling overall shoreline is migrating down slope to south.